I must say it was more than a little frustrating to miss the strong G3 geomagnetic storm two nights ago with smoke and clouds. The little coronal mass ejection (CME) which it seemed everyone thought would be a non-event certainly put on a show for those with clear skys. The next day we had thunderstorms and a cold northerly wind which has put a blast of autumn in the air and cleared the sky beautifully. The CME hung around long enough for me to get some follow up shots as the tail end of the stream passed though last night. This shot was taken when it was at Kp 4.3 , which is considered below minor storm levels, but was just enough for the aurora to outshine the full moon. 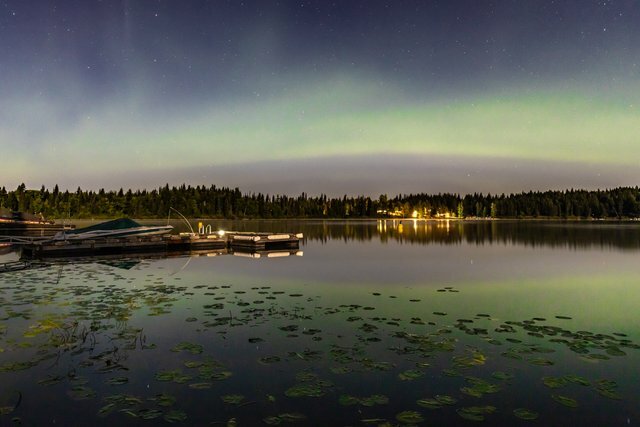 The shot was taken over Ness Lake. Northern British Columbia, Canada. Oh, Aurora is so beautiful! 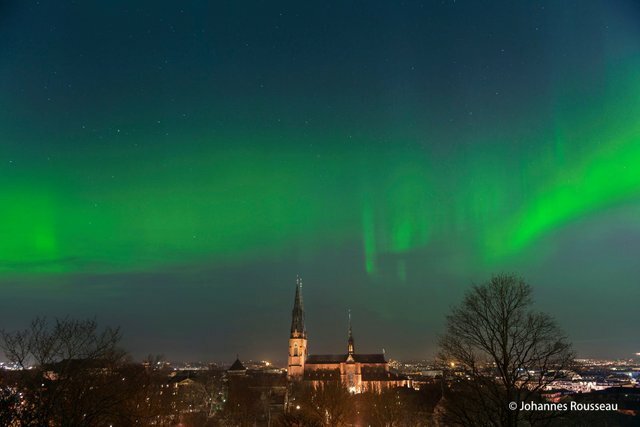 I live in Norway, but way to south for seeing it often. it happens sometimes though, and it takes my breath away every time! Your photo is amazing btw! Thanks. Very kind of you. I would love to spend some more time in Norway. I have only been to Oslo for business. wow.... loss for word there... the scene is magnificent.. is it aurora there?? i like it so bad... i wish i could see it by my self.... awesome photo it is... how long the exposure it is?? Thanks. It is a 20 second exposure. Yes that is the life of an astrophotogrpher at least ;-). If you could see it every night it would not be special. Which month it was, I really want to see. Hi Robert! What a beautiful shot! The sky and the reflection are mesmerizing! Unfortunately, as I was browsing the photofeed tag, I saw this photo posted by another user. It looked suspicious to me and I did some investigation and I was glad I found your post in the search results. Just want to let you know that your photo was stolen here. I have already reported to steemcleaners and will also take care of the rest on his profile. Just a thought though, you don't seem to put a signature over the photo. A signature is a very helpful way for us to see if the photo belongs to a user or not. (And will also decrease the chance of it getting stolen). Not necessary, but would be very helpful! (And I also checked your photo's metadata and it's a very good thing you have your name on the copyright section on it). Thanks. I appreciate you doing that. Unfortunately it happens from time to time. I have traditionally disliked using watermarks over my photos as I think it detracts from them and the reality is people can just crop the photo a little smaller or just remove the signature in photo shop or similar. you are most wellcome my dear. Perfect shot! At what time and season did you take this picture? As I said in the post I took it last night. Nice shot! Very beautiful picture. I am trying to learn photography with the help of my android, I have followed you! Come and visit my profile @jaimefrontado! give me some advices to create better pictures. Wonderful! I wish I could admire a sky so precious and different someday. This is what I love about picture blog about places. we learn and see thing we didn’t even imagine it exist. It has full of surprises. Thanks for sharing and do visit me sometimes, I am in Abu Dhabi and I love traveling and I have places to share to you for us to enjoy. Stunning .. brilliant, super, great. Really awesome shot on the full moon Pisces evening. Always wanted to see one of those live and in person they're gorgeous. What a great scene, glad you were able to catch the aurora. I saw many growing up but as a photography havent had the pleasure to get one yet. wow.... im up in whidbey island washington and i still haven't been able to see the northern lights. im going to go to Vancouver BC for christmas and im praying ill get a fantastic view like this then. im so jealous! sick picture. followed cuz obviously im jealous and hey, we both live so far north hahaha im excited to see some more stuff! The city lights are too bright around Vancouver. You will have to get out into the country side (or head up grouse mountain). The further north you go the less of a storm you need to see it.